Cloud services, especially multi-tenancy ones, offer users significant savings over traditional IT operations, while modernizing internal application provision through virtualization helps to keep organizations agile and productive. The UK is a progressive IT country, where new ideas are adopted quickly yet it is still important to remain cautious regarding new directions. In this cloud service webinar, Martin will size the current adoption levels of Cloud services and private Cloud building in the UK, giving examples of advanced users and innovative approaches. He will discuss the challenges of sharing, data jurisdiction and trust, while outlining the comparative advantages of different types of public and private Cloud adoption. 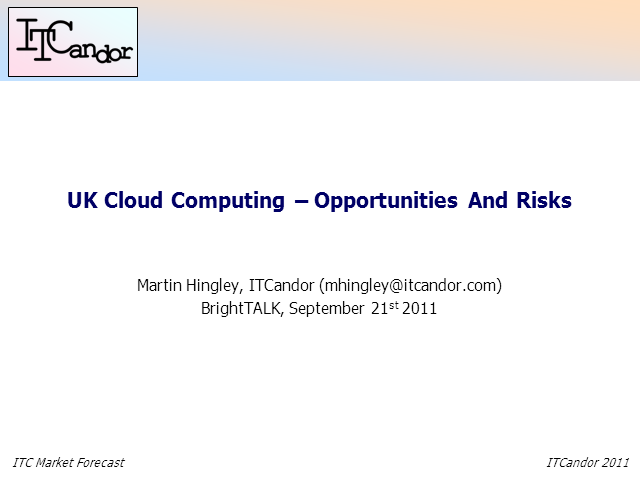 He will share ITCandor’s market forecasts and outlook for the UK market. Martin Hingley is a veteran industry analyst who heads up the independent research company ITCandor. He is a consultant, frequent blogger at and speaker. ITCandor sizes the ITC market on a quarterly basis, addressing themes such as Cloud Computing, Corporate Client Refresh and Corporate and Social Responsibility. It also helps users develop strategies to make the most of technology changes.